The market for Internet of Things has seen a somewhat unexpected acceleration in Q1/Q2 2018 and has lifted the total number of IoT devices that are in use to 7B. This is one of many findings in IoT Analytics’ latest “State of the IoT & Short-term outlook” update. Companies across the board, most notably IoT software, cloud and services companies, far exceeded revenue expectations. Microsoft Azure and Amazon AWS grew 93% and 49% respectively (within the last 12 months) with their IoT portion contributing significantly to the growth. But smaller players like C3IoT also reported a 60% revenue increase for the year. 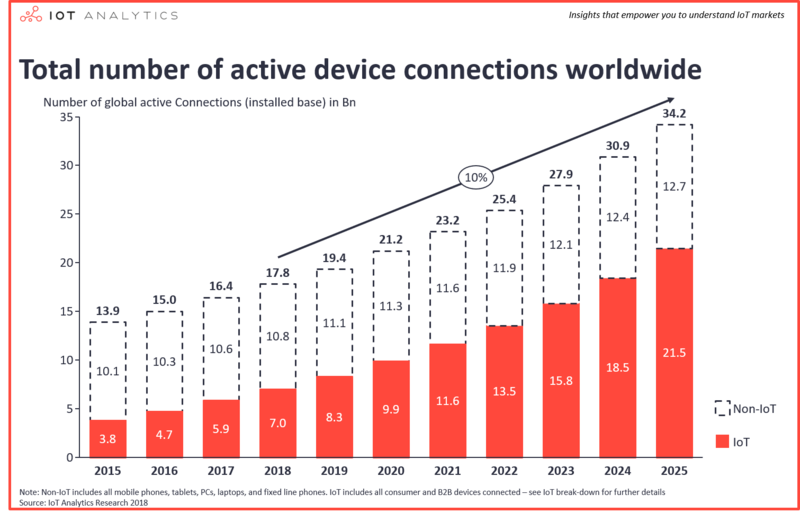 The number of connected devices that are in use worldwide now exceeds 17 billion, with the number of IoT devices at 7 billion (that number does not include smartphones, tablets, laptops or fixed line phones). The global connection growth is mainly driven by IoT devices – both on the consumer side (e.g., Smart Home) as well as on the enterprise/B2B side (e.g., connected machinery). The number of IoT devices that are active is expected to grow to 10 billion by 2020 and 22 billion by 2025. This number of IoT devices includes all active connections and does not take into consideration devices that were bought in the past but are not used anymore. The highest number of IoT devices are connected through short-range technology (WPAN) that typically does not exceed 100m in maximum range. These include Bluetooth-connected devices such as headsets but also Zigbee and Z-wave connected devices that can mostly be found in smart homes e.g., for connecting smoke alarms or thermostats. Another large category is Wireless Local Area Networks that cover connectivity of up to 1 kilometer. Wi-Fi is the most common standard in this category and seeing great growth, mostly through the use of home assistants, smart TVs, and smart speakers but also increasingly through use in industrial settings such as factories (although it continues to play a minor role in those settings compared to other technologies). A large chunk of the future growth in the number of IoT devices is expected to come from low-power wide area networks. By 2025, it is expected that more than 2 billion devices will be connected through LPWAN. The technology, which promises extremely high battery life and a maximum communication range of over 20 kilometers is used by three main competing standards, Sigfox, Lora, and NB-IoT, which are currently being rolled-out worldwide with more than 25 million devices already connected now, the majority of which are smart meters. Few people think of wired connections when they think of IoT. However, in many settings a wired device connection is still the cheapest and most reliable options. Particularly in industrial settings, fieldbuses and ethernet technologies use wired connections to a large extent and are expected to remain doing so in the next years. 2G, 3G, and 4G technology had for a long time been the only option for remote device connectivity. As LPWA and also 5G gain momentum, it is expected that these legacy cellular standards will lose share to the new technologies as they present a more lucrative opportunity to many end-users. 5G is the wildcard. Still under development in 2018, the technology which promises a new era of connectivity through its massive bandwidth and extremely low latency, is now heavily promoted by governments, particularly China. The Chinese government views 5G adoption as a competitive asset in the quest to move the equilibrium of technological innovation from the US and Europe towards China. In the US, the first pre-standard 5G networks will provide Fixed Wireless Access (FWA) services to residential and small-business users by the end of this year. While many more use cases will be targeted once the final standard is ratified in 2020, we should see first adopters already next year and do expect quick growth from there. Wireless Neighborhood Area Networks (WNAN) sit in between WLAN and long-range technologies such as cellular in terms of communication range. Typical proponents of this technology include mesh networks such as Wi-Sun, or JupiterMesh. In some cases the technology is used as an alternative for LPWA/Cellular (e.g., in Utilities Field Area Networks) and in other cases as a complimentary element (e.g., for metering deep in-door where nothing else reaches). Other technologies, such as satellite and unclassified proprietary networks will continue to play a role in the Internet of Things, although minor compared to the other technologies. The current market sentiment and short-term outlook is extremely positive. Software and platforms are expected to continue to drive the market as more data is moved to the cloud, new IoT applications get brought to market, and analytics continue to gain in importance. The 12-month outlook for connectivity and hardware is seen as stable as the increased number of IoT devices drive sales but margins for hardware generally decline. Some specialty providers of hardware (e.g., NVIDIA) seem to be exempt of the hardware commoditization. With LPWA technology just being rolled-out to global markets and 5G not yet mass-ready, connectivity players are expected to go through somewhat of a gap-year before it might take off in 2019 and beyond. The global market for Internet of Things (end-user spending on IoT solutions) is expected to grow 37% from 2017 to $151B. 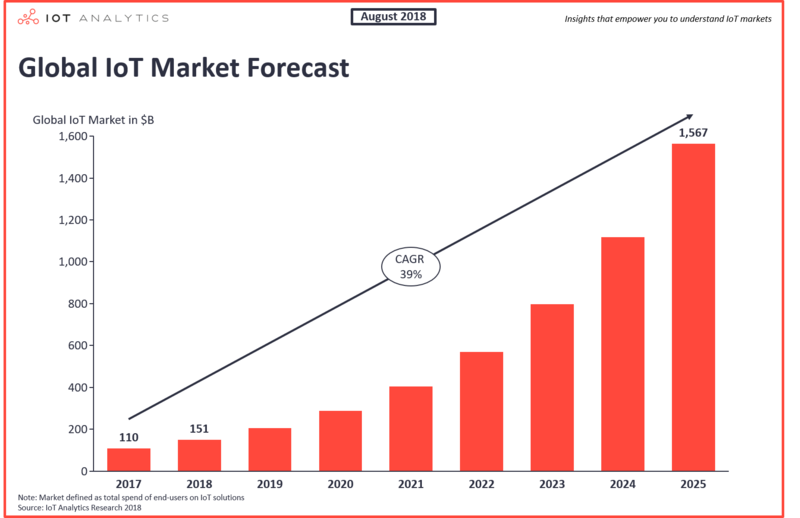 Due to the market acceleration for IoT (as discussed above), those estimates have been revised upwards and it is now expected that the total market will reach $1,567B by 2025. 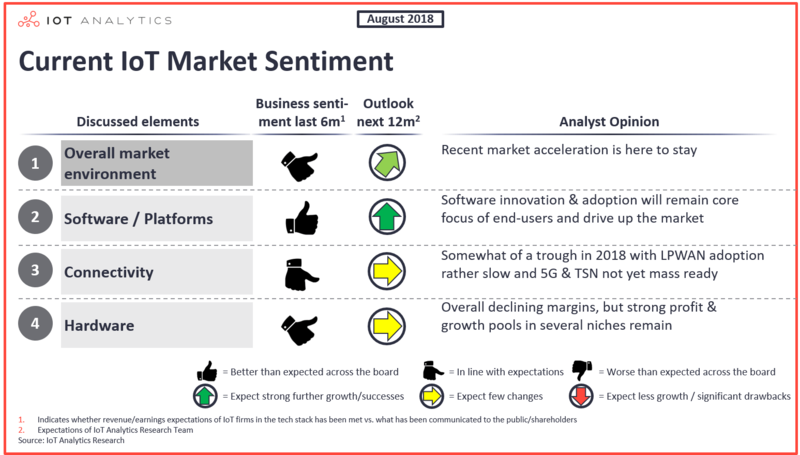 Today’s market environment is extremely dynamic and there are a few dozen trends that can be observed including edge-to-cloud integration, TSN connectivity, and IoT&blockchain trials. For this edition of the State of the IoT report, the analyst team at IoT Analytics summarized a total of 50 such insights. Insight 32, for example highlights that cloud vendors now increasingly make their own cloud-ready hardware to improve the interoperability and performance between IoT devices and the data that gets stored and analyzed in public or private clouds. Leading IoT cloud providers Microsoft, Amazon, and Google all recently announced their own hardware. The below is an excerpt from the report highlighting that specific trend and providing relevant proof-points. It remains to be seen if those moves from cloud to hardware will pose a threat to some of the existing hardware players e.g., gateway providers or chip makers. IoT Analytics will continue to monitor this and other trends. All insights and graphs in this article have been taken from the “State of the IoT & Short term outlook 2018” report, a 56-page in-depth market report which is available to IoT Analytics Subscription Customers. The aim of the report is to inform our subscribers about what is happening in the market so that they stay at the forefront of innovation and ultimately make the right decisions for their firms. The report includes 50 insights on the current market environment as well as market breakdowns by industries, tech stack, and region. Every insight is presented with examples and proof-points that the analyst team uncovered in the last 6 months by leading more than 100 expert interviews, attending 16 industry conferences, and listening to various briefing and analyst calls. The “State of the IoT & Short term market outlook” report is part of a series that gets updated every 6 months – the next edition is due out in January 2019. If you would like to share your perception of where you see the industry going or are interested to learn more about IoT Analytics research services, please get in touch with Leon Whyte leon.whyte (at) iot-analytics.com . To receive future such updates, subscribe to our newsletter or follow-us on Linkedin. 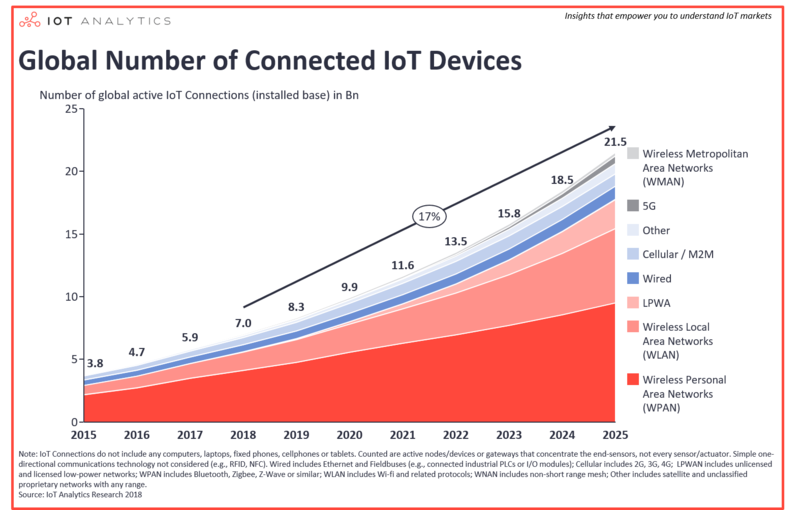 The post State of the IoT 2018: Number of IoT devices now at 7B – Market accelerating appeared first on IoT Analytics.